Inspirational Christmas wishes for the employees are sent to motivate the employees to do something good on Christmas. Be it doing charity or working for the betterment of the world, inspirational Christmas wishes motivate the employees to work harder for the society as a whole. 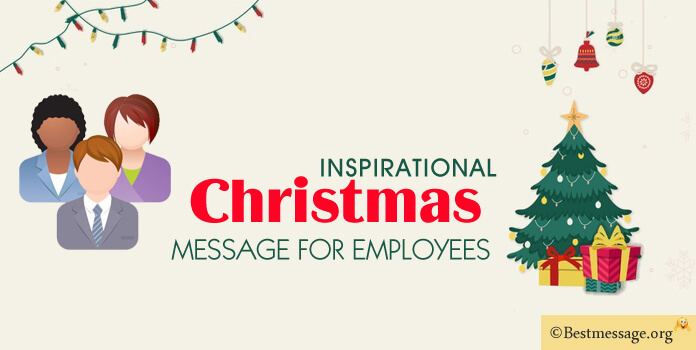 Read here for sample Inspirational Christmas message for employees. 1). Wishing you and your family a cheerful and wonderful Christmas blessed with happiness and feast…May you are blessed with prosperity and smiles in the year ahead. 2). You have been an integral part of company’s success and growth and a strong part of our family… Wish you all the success and happiness… Wishing you a warm Merry Christmas. 3). May the sweetness of carols and brightness of lights bring happiness in your lives and great success in times to come… Warm wishes to you and your family on Christmas. 4). Your hard work helps us grow. Your support helps us face the difficult times. We all are like one big family. Wishing all the happiness, success and strength for you all. Merry Xmas. 5). You have always impressed us with your dedication and commitment. Your performance has been incredible. We wish you Merry Christmas and another year of rocking performance. 7). Merry Christmas on behalf of the management. We thank you all for the commitment towards the company and we wish you and your family a joyous Christmas holiday. 8). The tremendous efforts of all the employees have made it possible to achieve the company’s goal. May this Christmas bring lot of joy in your and your family’s lives. 9). Christmas is the best time to appreciate your hard work. With sincere appreciation, we wish you all happiness and peace this Christmas. 10). We hope to see lot of energy and motivation among the employees the coming year. Let’s celebrate this Christmas with a prayer to reach new heights. Merry Christmas to you and your family.